A big problem every company struggles with is the costumer retention. There are many different marketing strategies to handle with the costumer retention, but one of the best strategies is to offer redemption gifts. Ehrmann, a German producer of yogurt recently started such a campaign. 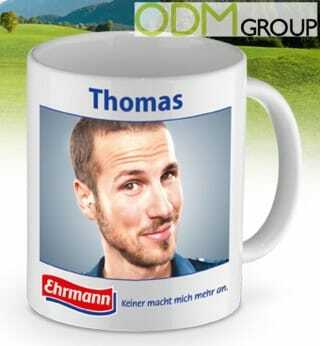 The consumer can get a free branded mug as reward for buying the Ehrmann yogurt. How do you get this one of this redemption gifts? The company equipped the yogurt packages with campaign-pints. To get the mug the costumer has to collect 10 campaign-points. On a normal yogurt is one campaign-point and on a big yogurt are two campaign-points. That way the costumer has to buy at least 5 products of the company. After collecting the points, they have to send in the points. Lastly, they get a voucher for a free branded mug. Why offering a free branded mug? Normally it’s the best way to choose a promotional gift which can directly be used with your products. But in this case the mug is also a great idea to promote your yogurt because they often are used together, during breakfast for example. Generally, mugs are a fantastic promotional tool. As they are used very common during the day, the costumer will handle them very often and therefore he will see the branded artwork many times a day. Furthermore a mug offers a big branding area and it’s easy to print whatever you want on the cover. Promotional products and marketing gifts are very diverse. If you are interested in learning more about promotional products, feel free to contact us.